Black Death in Europe in the Middle Ages was caused by the plague, which turns the lymph nodes black. An estimated 100 million people were killed. Historically, plague was found in Mongolia, then spread to China, then via trade with Europe spread throughout Europe. Flea infested rats on the ships were the carriers, and then were the main carriers in the cities in Europe. Human to human infection also occurred, via an airborne version of the plague called pneumonic plague. Rodents are very susceptible to infection from the bacteria, especially common rats. These rats are also host to parasitic fleas, which live off of the blood of other animals. The flea is not affected by the bacterium, yet still carries it in the blood extracted from the rat host in its digestive tract. The flea's ability to carry the disease without death makes it a perfect conduit of transfer from organism to organism. The Black Death was an epidemic of bubonic plague, a disease caused by the bacterium Yersinia pestis that circulates among wild rodents where they live in great numbers and density. From the bite site, the contagion drains to a lymph node that consequently swells to form a painful bubo, most often in the groin, on the thigh, in an armpit or on the neck. Hence the name bubonic plague. The infection takes three–five days to incubate in people before they fall ill, and another three–five days before, in 80 per cent of the cases, the victims die. While present and latent in many countries, the plague has recently exploded into an outbreak of the feared airborn plague in Africa, spreading to coastal countries of East Africa. This has emerged from flea infested rats, a population explosion and migration caused by heavy El Nino and La Nina rains. This began in the island of Madagascar, and is exacerbated by the annual tradition of digging up the dead and dancing with the corpses. Long lived bacteria thus are awakened anew from the corpses. 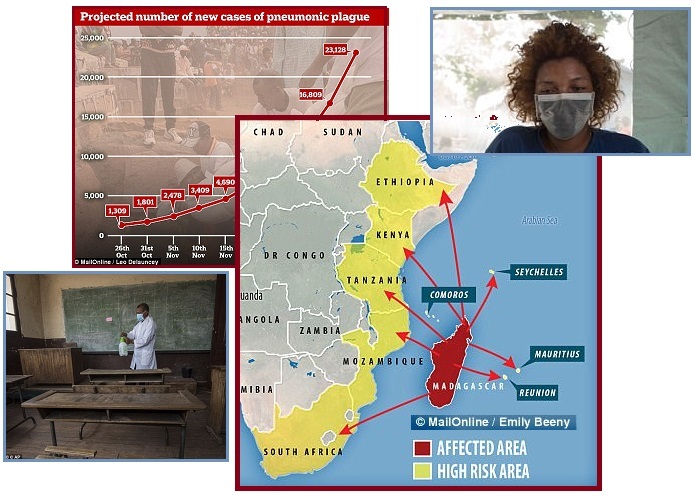 The deadly airborne plague spreading rapidly across Madagascar is now at 'crisis' point as cases have rocketed by 37 per cent in just five days. The outbreak, the 'worst in 50 years', is being fueled by a strain more lethal than the one which usually strikes the country off the coast of Africa. The most recent statistics show there have been 127 deaths. The 'truly unprecedented' outbreak has prompted warnings in nine nearby countries - South Africa, Seychelles, La Reunion, Mozambique, Tanzania, Kenya, Ethiopia, Comoros and Mauritius. Two thirds of this year's cases have been caused by the airborne pneumonic plague and means it is spread through coughing, sneezing or spitting. 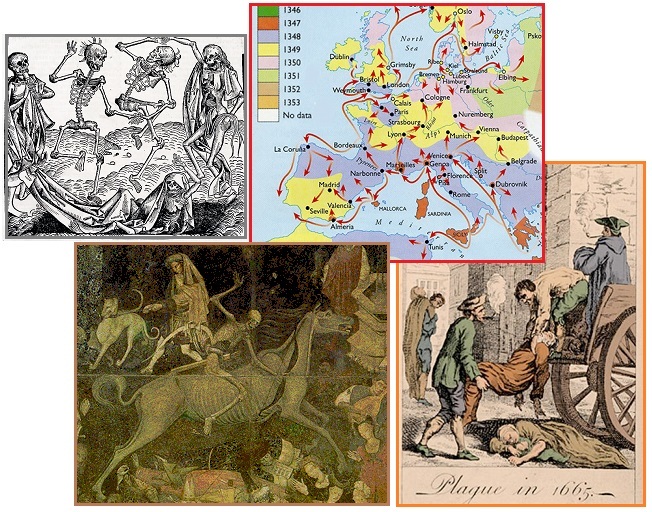 Historically, plague has been responsible for widespread pandemics with high mortality. It was known as the ‘Black Death’ during the fourteenth century. Plague was called Black Death because it sometimes causes the lymph glands to swell up and turn black. These prominent buboes give their name to bubonic plague. But far more dangerous and deadly is the pneumonic form, which infects the lungs and which can be spread person to person directly, rather than via flea bites. Plague is now rare in developed countries, but it’s an ongoing problem in Madagascar. Plague is found around the world, latent in the flea and rodent populations in many countries. Historically it arose in Mongolia, spread to China, then via trade to Europe and via rats on ships to the New World, the Americas. Thus plague was found in the Ukraine in 2009, in China and the Congo, and in Arizona in 2017 where it was killing Prairie Dogs. 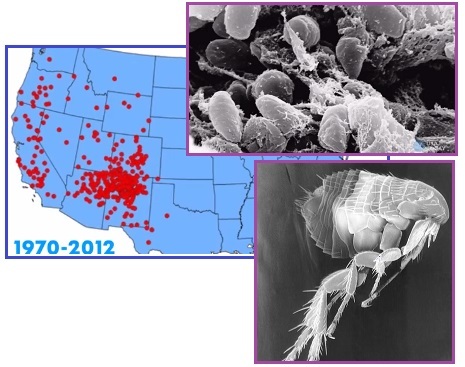 Fleas tested positive for the bubonic plague in two counties in Arizona, with public health officials warning the infectious disease that claimed millions in the Middle Ages may exist in other nearby locations, too. The plague's presence in Arizona follows three confirmed human cases in New Mexico earlier this year. Fleas in the area later tested positive for the Yersinia pestis, the bacterium that causes the plague. About seven cases of the plague are reported in the United States each year, according to the Centers for Disease Control. The disease first came to the United States in 1900 aboard steamships carrying infected rats. 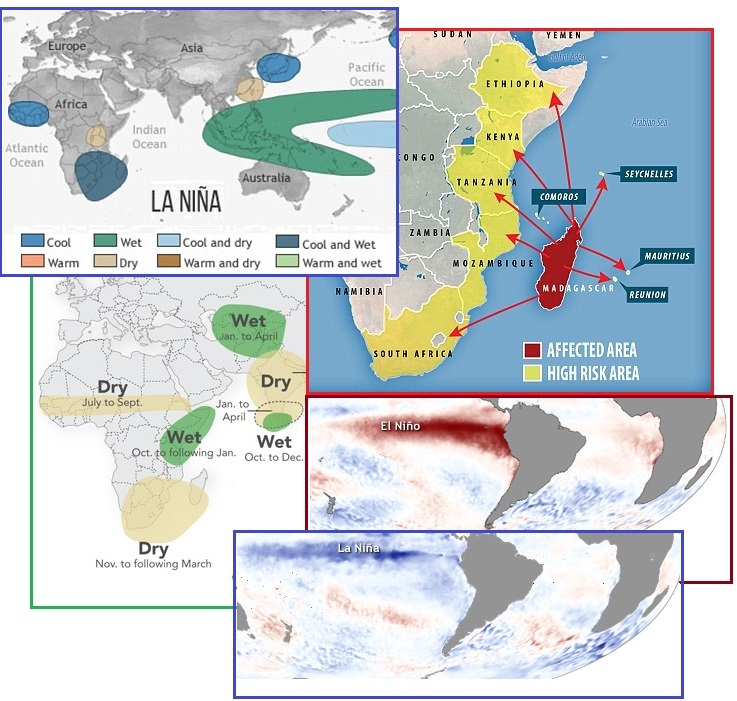 The outbreak in Madagascar is suspected to be due to a stronger El Nino and La Nina, which is at base caused by increased activity of underwater volcanoes in Indonesia. This warms the Pacific waters which flow to the Americas, creating more rain, but also affects ocean currents and the resulting rain worldwide. Plate movement, the 7 of 10 plate movement and the daily Earth Wobble, exacerbate this, creating an uptick in volcanic activity worldwide. This is another example of Zetas Right Again, Nibiru causing climate changes which result in increasing illness. Experts believe the natural phenomenon dubbed ‘Godzilla’ triggered an increase in rat populations in rural areas, sparking the beginning of the epidemic. Forest fires have also driven the rats and their plague-carrying fleas towards areas inhabited by humans, local reports state as a reason behind the surge in cases recorded this year. Floods and heavy rains – triggered by Cyclone Enawo, may also be to blame. ZetaTalk Prediction 2/15/1998: Increasingly, as the pole shift nears, the populace will take sick. This will take the form of known illnesses occurring more frequently, seemingly depressed immune systems, but will also appear as new and puzzling illnesses not seen before in the memory of man. What is going on here? The changes at the core of the Earth that have resulted in El Nino weather patterns and white buffalo and deformed frogs also affect man. Not only is the body asked to adapt to a changing environment, where radiation elements unknown to man are increasing, various infectious agents are also influenced to behave differently. Exposure patterns are thus changed, with infections occurring in circumstances otherwise considered healthy. The germs are on the move. Their carriers are on the move. And thus humans are exposed to diseases that are so rare as to be undocumented in medical journals. You will see increasing illness, odd illnesses, microbes that travel because an insect is scattering about and spreading germs in places where it normally doesn't travel. ZetaTalk Prediction 11/17/2007: We stated early in the life of ZetaTalk that increasing illness would occur - among humans, livestock, and wildlife. The changing climate causes germs and the creatures who carry them to migrate, so those without natural immunity are more vulnerable. There are thus outbreaks, so that even those with strong immune systems might find themselves affected. This is not going to change, but will get worse. As the Earth changes increase and the horror of what is coming cannot be denied, more people will become emotionally depressed and their immune systems will weaken. The pole shift will bring with it radical climate change, with all that entails for opportunistic germs and migrating germs. On November 4 a coup against King Salman and his Crown Prince was foiled. Per the Zetas this nexus with the November 4th Unity Day speech by Putin and the November 4th planned nationwide riots by Antifa in the US intended to depose Trump and the planned nationwide blackout exercise by the DOD and amateur short wave radio groups to take place from November 4-6 is not an accident. 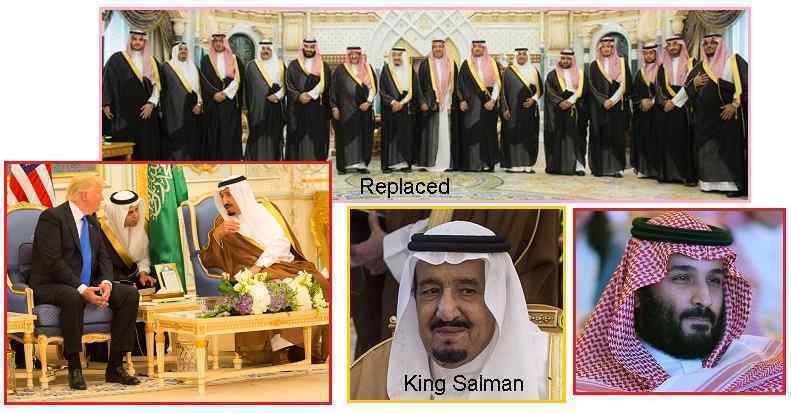 While the US military was distracted by riots in the US, King Salman would be assassinated. That plan obviously failed. A plot to overthrow Crown Prince Mohammed bin Salman has been interrupted, but gunfire has now erupted in the Capital city of Riyadh. Arrest warrants have been issued to take into custody at least 11 Saudi Princes (inside the Royal Family) and 38 other Ministers and high government officials - on initial charges of "Corruption." By Royal Decree, the King of Saudi Arabia has relieved from power the Minister of State, the Minister for Economy and Planning, the Chief of the Saudi National Guard as well as the Commander of the Naval Forces! Prominent billionaire, member of the royal Saudi family, and one of the biggest shareholders of Citi, News Corp. and Twitter - not to mention frequent CNBC guest - Al-Waleed bin Talal, for corruption and money laundering charges on orders from the new anti-corruption committee headed by Crown Prince Mohammed bin Salman. ZetaTalk Insight 11/30/2017: The excesses of Saudi princes and princesses have long been noted around the world, an extreme embarrassment to the conservative Saudi King. This change to put the Crown Prince in charge has been in process for many months, but the sudden and forceful completion was not part of the long range plans. What happened to ignite this? 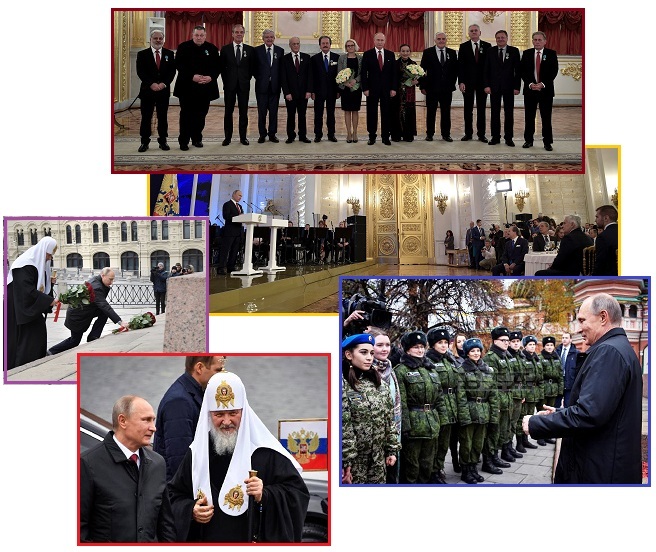 There has been a nexus between Putin’s planned speech on Unity Day in Russia on November 4-6, Antifa’s planned nationwide riots in the US starting on November 4th, and the DOD’s plans to have a nationwide blackout exercise from November 4-6. Since the Soros organization is funding Antifa, and recently gave 18 billion to fund various riots attempting to depose Trump and gain control of the White House, the nexus with the Saudi coup shows a wider picture. The Transformation Team, which includes ZetaTalk and Anonymous and Trump’s Junta, was busy preventing Soros funds from hiring paid rioters, so the planned Antifa riots failed to ignite. The Soros group, which includes the Bush/Clinton criminal cabals and members of the Jewish banking cartels, planned to use the distractions in the US for a wider takeover, including an assassination of King Salman. The takeover attempt in the US was foiled, as was the takeover attempt in Saudi Arabia. Indeed, the Saudi nephew had been a Soros/Clinton ally, donating heavily to the Hillary 2016 election fund. Thus during the planned chaos in the US on November 4th, the Soros/Clinton cabal hoped to assassinate King Salmon and his Crown Prince, securing and continuing their hold on the Saudi oil and funds. It’s clear which side is winning. It’s worth noting that Saudi Arabia accounted for 20% of the Clinton campaign’s funding in 2016. Among the royals arrested was billionaire and Clinton Foundation donor Al-Waleed bin Talal, best known for picking a fight with Trump on Twitter during the 2016 Presidential Election. Saudi Arabia’s purge of pro-Clinton royalty like bin Talal is more evidence that the old guard establishment is finished with the Clinton/Bush machine because their brand of globalism is failing. Activities surrounding November 4 had the appearance of a potential announcement about Nibiru by Putin on Unity Day, when his speech is widely published, combined with nationwide Antifa demonstrations starting on November 4, and the DOD scheduling an EMP/blackout exercise at the same time, from November 4-6. It certainly looked like a potential Nibiru admission by Putin would result in riots in the US. But Putin’s speech did not include any reference to Nibiru. Seven other figures from different countries also received the order of friendship for enhancing relations between their countries and Russia. President Putin thanked the figures for their contribution to boost friendship and historical, cultural and business ties between their countries and Russia. Vladimir Putin: Good afternoon, colleagues, friends, ladies and gentlemen. I extend my greetings to you on National Unity Day, a holiday that is rooted in the past. … Unity and patriotism have been the most reliable support for the people both in times of trouble and in solving large-scale development tasks. … There is just no other country as large and multi-faced as ours. Preserving the diversity of the peoples of Russia, their ethnic and cultural identity is of key significance to us, as are traditions of mutual trust, concord and closeness. These foundations permeate the unity of the Russian nation with special inner power. At the same time, the same day, Antifa was planning a massive nationwide demonstration. This was announced in late September and promoted by a full page ad in the New York Times on November 1, an ad paid for by the Soros organization. There was no logical or explained reason for November 4th being planned as the day. Thus the suspicion that the rumors about Putin announcing Nibiru on that day grew. The Soros group had paid for rioters during the Charlottesville riots last August, and could be expected to do the same. George Soros, the billionaire hedge fund manager and a major Democratic donor, has given $18 billion to his Open Society Foundations, one of the largest transfers of wealth ever made by a private donor to a single foundation. The gift, made quietly over the past several years but disclosed only on Tuesday, has transformed Open Society into the second-biggest philanthropic organization in the United States, behind the Bill and Melinda Gates Foundation. Demonstrations were planned in 20 US cities (Atlanta, Austin, Boston, Chicago, Cincinnati, Falmouth MA, Honolulu, Indianapolis, Los Angeles, Minneapolis, New York City, Omak, Philadelphia, Pittsfield, Portland, Salem, SanFrancisco, Seattle, and Tucson), with the mob encouraged to keep it up until Trump steps down. Start times are generally in the late morning, so clearly planned to be a reaction to something that might emerge from Russia earlier on November 4th. The New York Times published a full-page ad calling for a “revolution” to overthrow President Trump on Nov. 4. “Join with the thousands who will gather in cities and towns across the country,” reads the ad. “A movement of protests that continue every day and night, growing until we become millions… determined not to stop until this regime is driven from power.” The ad was written by Refuse Fascism, a communist group funded by George Soros. Coincidentally, or not so coincidentally, the US Department of Defense planned a nationwide blackout drill. This was to simulate a crisis wherein a Solar Coronal Mass Ejection (CME) caused an electro-magnetic pulse (EMP) emergency nationwide. Short Wave radio groups such as AARL were asked to participate. This meant that short wave amateurs would be at the ready on November 4th, for any type of emergency that might emerge. Again, not so coincidentally, this exercise was to occur Nov 4-6! According to The National Association for Amateur Radio (ARRL), elements of the US Department of Defense (DOD) will simulate a “communications interoperability” training exercise across the United States on November 04-06. The announcement released on October 24 has not been widely distributed to the media, because the drill is simulating a total grid collapse and could spark public fear. The US Department of Defense (DOD) training exercise will occur on ANTIFA’s day of rage across the United States. This exercise will begin with a national massive coronal mass ejection event which will impact the national power grid as well as all forms of traditional communication, including landline telephone, cellphone, satellite, and Internet connectivity. We want to continue building on the outstanding cooperative working relationship with the ARRL and the Amateur Radio community. So what happened? 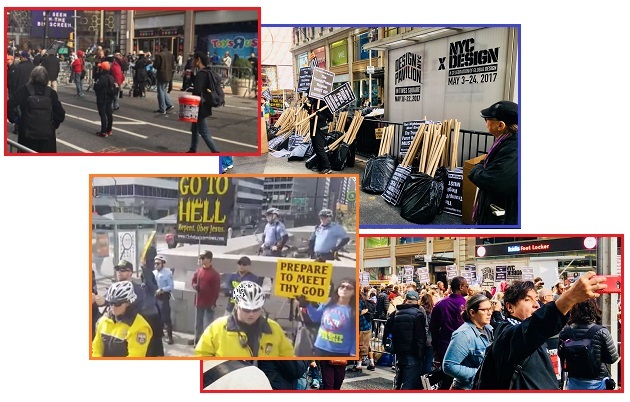 The Antifa demonstrations were a big nothingburger, a dud, a bust, as noted on the popular GodlikeProduction message board. There were no riots. There was no continuation, as announced, to keep it up until Trump and Pence were deposed. There were only a handful of demonstrators and it was all short lived and not even covered by the major media. It is, as the Zetas stated in their explanation for the Saudi coup attempt, as though the funds to pay rioters had been confiscated behind the scenes. Inciting riots is, after all, terrorism, and thus against the law. Protests attended by snowflakes and unicorns. Over a thousand people had previously committed to going to the November 4 protests on Facebook, and roughly five thousand had pledged interest, but when all was said and done, burgeoning leftist groups like Democratic Socialists of America (DSA), protest mainstays like Industrial Workers of the World (IWW) and the masked anarchists that had captured the imagination of people on the far right failed to attend. Was the DOD wrong to schedule a nationwide EMP exercise, running from November 4-6? Whatever their intel was, it was on target in one respect – the US was struck with a nationwide DDOS attack on November 6, lasting from 1:00 pm to 4:00 pm. 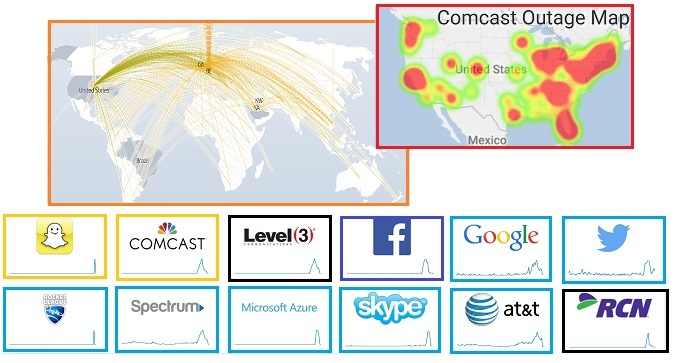 Dozens of Internet aps were affected, with the GodLikeProduction message board tracking ComCast as the primary victim. The DDOS attack appeared to have the US as its target, with the flood of transactions coming mainly from Soros country in Europe. Comcast's internet service, Xfinity, appears to be suffering an outage across the country. DownDetector.com shows it being down around the United States, including in large cities like San Francisco, Los Angeles, and Boston. So far, online reports don't suggest that TV service or home phones are affected. The outage appears to have began around 1 PM ET. Some users report intermittent or slow services, while others were unable to access the web at all.